The sky was clear and the stars bright as we waited for our ride to the days fishing destination, another road trip my wife and I had both been looking forward to. With the vehicle loaded by 5:15 A.M., we were on our way to a body of water none of us had fished before. 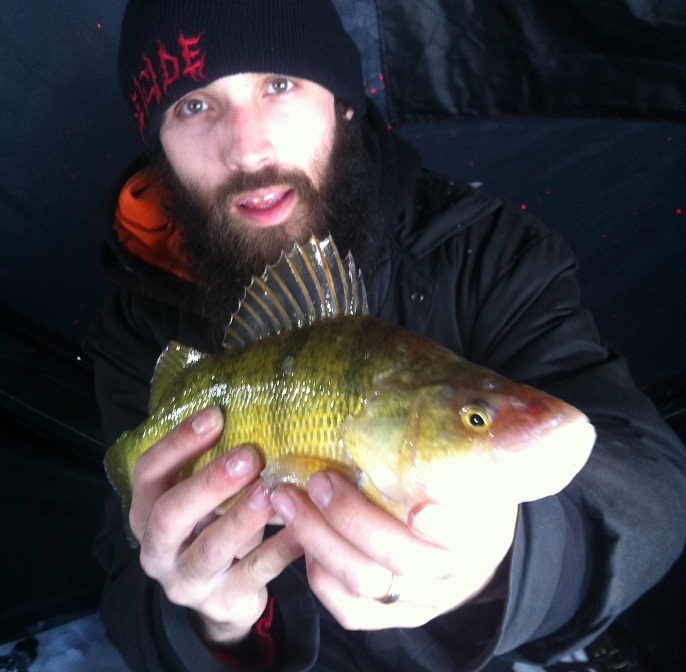 We had been targeting perch a few times this winter, usually having days with good numbers and steady action but no Master Anglers. Today was the day we were going for some yellow and green footballs we knew were in this lake, and the odds were good that at least one of us was going to ice one. The conversation on the way there was filled with our plans and options for the day, what lures we were going to try, would we run and gun or sit and wait, any special baits, even a friendly wager on biggest fish caught. It was clear everyone else was as excited as I was. 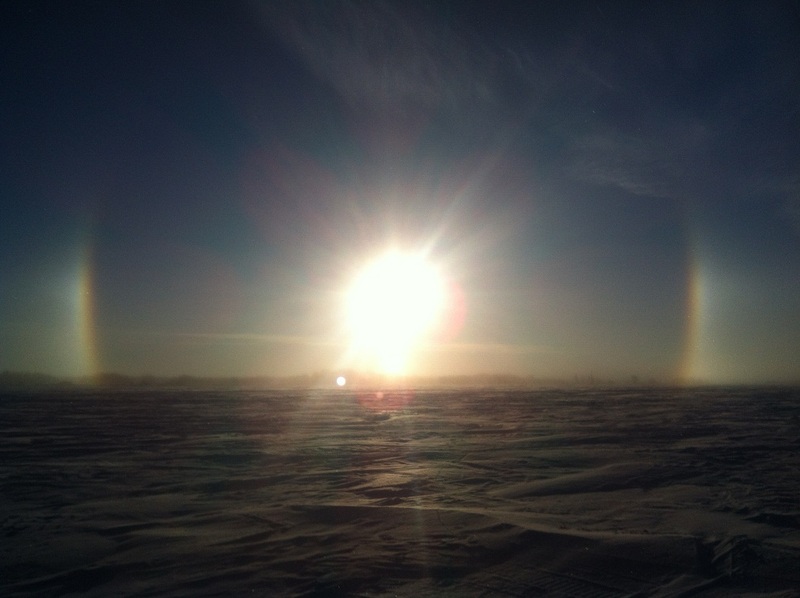 The sun began to rise as we arrived at our destination, we loaded the sled with as much gear as we could and headed south west a few hundred yards to punch some holes. Looking back we were graced with a sun-dog breaking the horizon, the fourth I had witnessed this year After an exhausting hike pulling around 150 pounds of gear we decided where we were was as good a place as any to start, so Fisher45 fired up the auger and began punching holes. 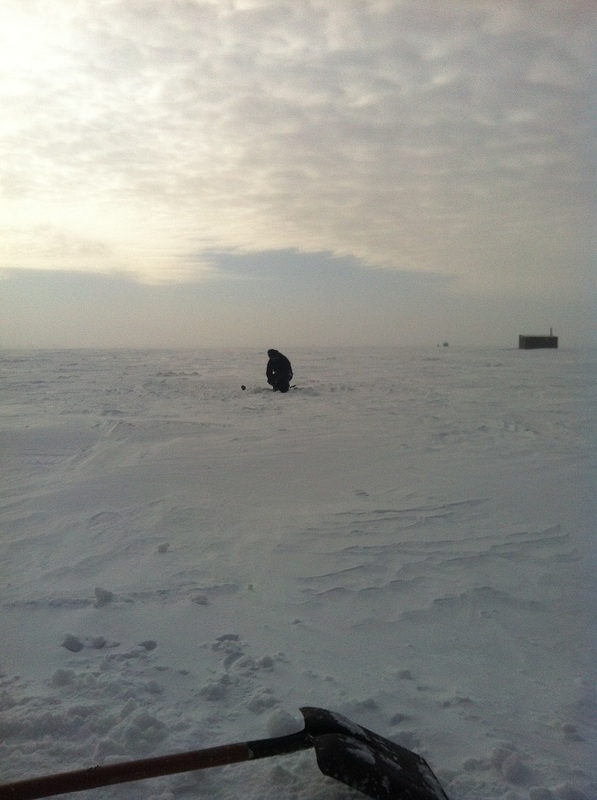 The ice was thick, extension thick, we checked our depths and set up a home base, as it was -20 or so with a light wind that was to pick up as the day progressed. Now we were ready to fish. We had come prepared with a few extra rods to save time on reties and to be able to throw back a different offering if what we were using was not being pursued. On our dead sticks we were using 1/16th and 1/8th jig heads with small salted minnows or just heads or tails. We all tried different lures on our jigging rods, hoping to narrow down what might entice a strike and land a big one. I started with a small perch pattern spoon tipped with a minnow tail. On a previous trip I had landed a medium sized perch on a jig and minnow that had a small perch tail sticking out of its mouth, so I thought it was a good colour scheme to start with. It wasn't long before i got my first hit, a light one with a swing and a miss but no follow up. 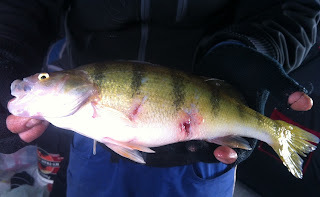 The jumbo perch we were targeting behave slightly differently than their dinky offspring, at least they were this day. A few more nibbles without a hook set and I decided to change to a jig head with a variety of soft plastics. Same results, nibbles, bites, no hook sets. What was I doing wrong? I wondered if each bite may be my last of the day and wanted to be free of the skunk stripe, so I kept at it. I have some basic principles when fishing, confidence, finesse and technique being a few of them and my confidence was fading fast. difficult. 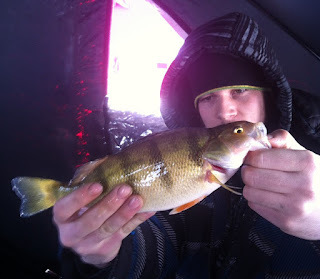 After half an hour in the light blowing snow and more missed marks, it was back to the shelter where my wife had landed her new personal best ( to be improved upon later) 11 inch perch. After about the 10th missed hook set, I was accepting the fact that I might get skunked. Most of the success beside us had come on a small rattle bait, so I switched over to one tipping it with a minnow tail and began to work the lure. It definitely sparked their curiosity, a few bites and you guessed it, missed hook sets and I was ready to throw in the towel. Two and a half hours fishing, fourteen missed bites on my part, my wife had caught two nice eaters above 10 inches and under 12 and missed four bites. Beside us a few perch and a feisty pike had been iced and released, it was shaping up to be a good day, nonetheless and I needed my confidence back. Jigging and twitching the lure it was then that the biggest mark I had seen all day raised off the bottom on the flasher screen, a bit of coaxing and it followed a foot up and struck hard. Hook set and I began to reel, it felt like a good one and as I leaned over to pull out the transducer it shook off. Down goes my float in the neighbouring hole and I quickly reached over and set the hook, a bit of a fight with some soft runs and up comes a nice perch, measuring tape out and it's a personal best 14 1/4 inch. A few pictures taken and off it went back down the hole to fight another day. What a relief, all those missed hook sets and the first one I ice is a Master Angler. Confidence back, both lures re baited and down the hole, it wasn't long before I landed back to back eaters under 12 inches. I had caught up to my wife, only to have her pull ahead with two more eaters. The school had moved through with action picking up and dying off quickly. We would have hole hopped to follow the school but the weather just wasn't in our favor, the best we could do was re bait and drop down as quickly as possible. In the middle of snacking on a sandwich the call for the measuring tape came from beside us. I reeled in, jumped up and headed over to see a double header, a huge 15 1/4 inch perch on the rattle and one over 12 on his dead stick, pictures, measurements and back down the hole they went. Just before the double header Fisher45 spoke up about how it's time for one over 15 inches, and it wasn't more than three minutes before it happened. 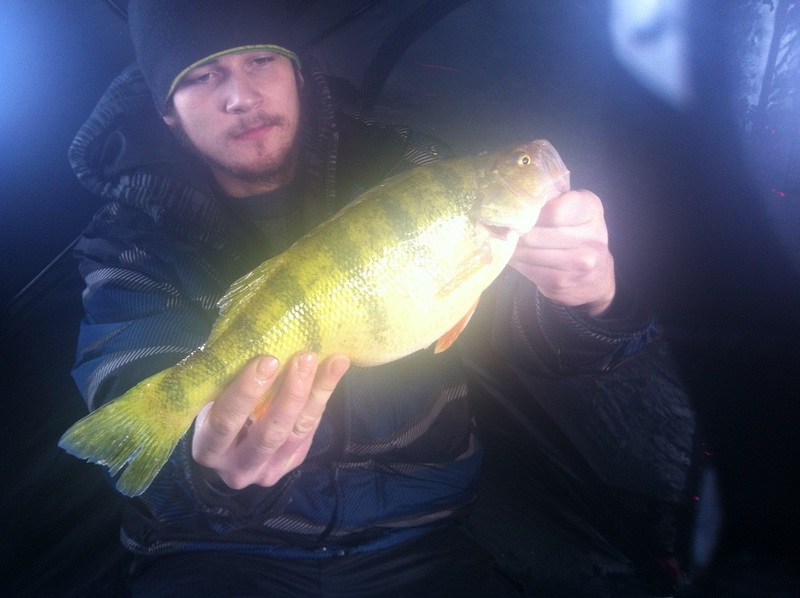 The perch really were good looking fish, their colours shining over the snow covered ice, dorsal fins flared like a walleye, these girls were plump. Back in our shelter, I changed over to a few small spoons with some success, with six eater perch kept for the next day's meal, it was all catch and release from here on in. The hottest action seemed to be from 10:30 am to 1pm at which point the wind really picked up and the clouds covered the sky. That didn't matter as we had driven a fair distance and were making a day trip out of it, slower bite or no bite we were sticking it out as long as daylight allowed. With the action slowing down we offered what was below as many different lures and baits as we could. A few more missed hook sets and one or two hefty ones lost on the way up and it was back to the rattle bait. Watching the lure flutter down on my flasher screen, it instantly lit up with 3 separate thick marks. A few twitches and wiggles and the hardest bite I felt all day followed, quick hook set and the fight began. I reeled in slowly keeping tension on the line, as I bent over to pull out the transducer, the fish below started to go on a run peeling out some line. I stood up and reeled in until a second run took place, playing the fish carefully I could feel the fish fighting and thrashing. It wasn't long before I saw its head at the bottom of the ice. It was clear this one was big, a nice slow pull up to the ice edge and I shoved my hand in the hole to scoop it out. This fish was heavy, not as plump as maybe closer to spawning season, but impressive length! Our friends came over to see the fish and there were cheers and congratulations all around as it measured out at 16 inches! I didn't know it at the time but I had a real trophy in my hands, a few pictures taken and I placed it back in the water holding the tail lightly, waiting for the kick and it slowly swam back down the hole. Hopefully she will grow a bit more and provide someone else with as much joy and excitement as it provided me with, including a new record for the province, although there's a good chance it may be someone's next meal if caught again. I personally can't bring myself to eat trophy sized fish no matter what the species and typically have a slot size I keep in mind if I am planning on a meal. With a few hours before dark the bite had slowed and seemed to become finicky again. The rush of the trophy perch was still running through me, I kept one eye on the float and one on my flasher down the jigging hole. The wind picked up and the snow began to drift by our shelters, I thought to myself how the road out had probably blown in, it could be an interesting drive out. Beside us they called out that they had a really nice pike on the line and wouldn't you know my wife gets a really good hit, double header pike to end the day? A fight ensues with both anglers confident they have a good one on the line, some serious bend in the light rod and line peeling out, I wondered how big this one really was. 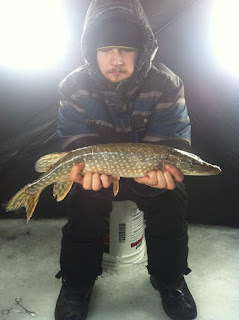 I saw the head at the bottom of the ice and began to hand bomb my wifes line and help land a 25.5 inch pike with both her lure and our friends lure in its mouth. Hooks out, some laughter and comments exchanged and back down the hole. It was the last fish we would see in our shelter that day. A few more landed beside us including a perch with some pike bite wounds but nothing from 4 P.M. until we began packing up at 5:15 P.M.
As we packed up our gear and took down our shelters, it was clear in the distance a truck was stuck on the road out. By the time we got to our vehicle at shore we learned we should have parked a few hundred yards further to avoid the ruts that previous trucks had created through the blown over road. Loaded up we were ready to blast through a bunch of snow where vehicles with more capabilities than ours had already spent 30 - 60 minutes getting stuck and towing each other. We knew we shouldn't but had no choice, we had to get home. With as much speed as we could get, we pushed forward only to make it half way through. We were hung up on 2 plus feet of hard packed snow with 3.5 feet or more on either side, the ruts ahead of us were blowing in fast. Shovels out we began to dig, this did not look good, our wheels no longer touching the tracks we heaved away as much snow as we could. After 10 minutes of shoveling we were getting nowhere fast. I headed up the road to the trucks ahead to ask for a tug, but was informed there was no one willing to break trail back to help out. They wished us luck and hoped someone was still coming off the lake to maybe pull us backwards. On the walk back to our vehicle it was clear we were in some serious trouble, the wind was gusting even more and the sun setting, how was I going to explain to them no one wanted to risk pulling us out. It was easy, but the language is not appropriate for this publication. Another 20 minutes of shoveling and the last truck was coming off the ice, only to get stuck 200 feet behind us. The group ahead of us I had asked for help, had been waiting around and talking, killing time we guessed to see if we would get out. As total darkness hit two locals began to break trail back to us, they swerved and bounced and made it with in tugging distance. After a few attempts it was clear they needed to back in to pull us out, not an easy feat at all. Somehow, they backed all the way through the drifts and ruts, snow flying everywhere to try again. A few good tugs and off we went through the rest of the thick snow to the clear road ahead. A brief chat and a couple of twenty dollar bills their way as a kind gesture and we were on our way through the blowing snow home. On the drive home we talked about the day's happenings and a possible trip back in the future. Two of the four of us landed Master Angler perch and we all wondered how many more we may have lost or missed. Countless things were learned that day, that will not soon be forgotten, and the friendliness of the local Manitobans a reminder of another reason our fishery is what it is.